Trip and Fall at NYC Subway Station Raises Questions of Fact for the Jury - Leandros A. Vrionedes, P.C. 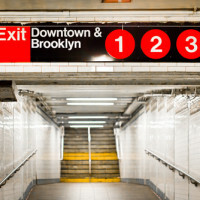 Earlier this year, the Supreme Court of the State of New York, New York County, had the occasion to rule on the NYC Transit Authority’s motion to dismiss a personal injury case filed against it, arising out of a trip and fall at a New York City subway station. The court held that the plaintiff had raised sufficient questions of fact to allow the case to move forward to a jury trial. The accident at issue in the case of Yukowitz v. New York City Transit Authority occurred on April 24, 2010, when the plaintiff, Marilyn Yukowitz, tripped and fell on what she alleged was defective metal nosing on the top step of stairway P2A, which is the entranceway leading down to the West 4th Street subway station at the corner of Sixth Avenue and East 3rd Street in Manhattan. The plaintiff had a professional photographer come out and take pictures of the stairway a few days after the accident, and these photographs played a pivotal role in the court’s decision, although not perhaps in the way the plaintiff had originally anticipated. In the defendant’s motion to dismiss the complaint, the Transit Authority claimed that the defect was trivial and also that it did not have actual or constructive notice of the alleged defective condition. If either claim were true, the court would dismiss the case. To show the defect was trivial, the Transit Authority referred to the plaintiff’s own photographs, claiming the pictures do not show any raised lip on the top step which would cause a trip. On the lack of notice issue, the defendant argued that the tread on the stairway had been repaired in January of that year, and that the stairway had been inspected 8 days prior to the accident and had been found to be defect-free. In opposing the motion, the plaintiff argued that the photos don’t do a good job of showing the height differential on the step. A friend of hers testified that she was present at the time of the accident and inspected the steps and saw the height differential for herself. This witness agreed that you cannot see the height difference from looking at the photographs. The judge also agreed; he too could not tell from the photographs, which did not include any close-ups, whether the defect was trivial or not. Since the pictures were not definitive one way or the other, and the defendant didn’t offer any other evidence, such as physical measurements of the step, to strengthen its argument, the court ruled that the plaintiff had raised sufficient questions of fact regarding the photographs and the step. The court also ruled that the issue of notice was an open question. Defendant’s evidence about the prior inspection was too vague; the defendant didn’t go into any detail about what the inspection covered and whether the alleged defect would have been found during such an inspection if it existed. All this uncertainty was enough to keep the case moving forward. The judge denied the Transit Authority’s motion to dismiss the complaint, and the case will proceed toward trial.